Blogging has been slow lately – I have too much fun doing Tomorrow.sg. I was involved a little doing mostly the technical infrastructure for Tomorrow and the last few days I have been fighting with a huge load problem. The server running Tomorrow.sg is being pushed to its limits, thanks to all the traffic on the site. Under normal circumstances, the server could manage the stress, but as there are a couple of other high volume sites (like the Infantile podcast by mrbrown) on the same machine, so together, they can literally kill the machine. While I’m embrassed that this happened, in certain ways, it is a great problem to have. We are now taking some emergency measure to move this to a dedicated machine. Altho only a week old, Tomorrow.sg are already pushing several case into limelight, such as the scholar who made some racist remarks that subseqently got reported by MSM (mainstream media). Or the posting that label Singapore’s blogs as Infantile which caused the whole Singapore’s Blogosphere to go up in arms. And today, we got a nice pleasant surprise to see Tomorrow.sg quoted in the papers. And we are barely a week old :-) It is going to be exciting Tomorrow. Blogs will change your business. Look past the yakkers, hobbyists, and political mobs. Your customers and rivals are figuring blogs out. Our advice: Catch up…or catch you later. 1) Singapore bloggers are working to put together an event to talk about blogging! We should have more details on this shortly once we ironed out a few more details. 2) finalizing and launching tomorrow.sg, a site by Singapore bloggers for Singapore bloggers. Think of it as Boing Boing for Singapore, linking to the various interesting articles in Singapore blogosphere. To keep it interesting and relevant, we will need you, the bloggers and readers, to recommend articles to us – anything so long it is related to Singapore. Afterall, Malaysia bloggers have their petalingstreet, Singapore bloggers shall have a better tomorrow (erm…sound a bit corny). Many knickers are twisting into knots over the questions ofwho is a journalist and how to save journalism. But those are the wrong questions. Journalism is not defined by the person who does it or by the medium or the company that delivers it. Journalism is not a thing. It is an act: The act of informing is journalism. It’s a verb, not a noun. And no one owns journalism. It is not an official act, a certified act, an expert act, a proprietary act. Anyone can do journalism. Everyone does. Some do it better than others, of course. But everyone does it. Realizing that — embracing that — will be the key to saving journalism: its quality and its business. At least, I am already an April Fool two days earlier. I been using feedster to montior keyword voip and I notice a there are more and more job postings on voip like this. As of March 2005, technorati is tracking 7.8m weblogs (937 millions links) growing at 30k to 40k per day. There is a dark underbelly to these numbers, however: Part of the growth of new weblogs created each day is due to an increase in spam blogs – fake blogs that are created by robots in order to foster link farms, attempted search engine optimization, or drive traffic through to advertising or affiliate sites. 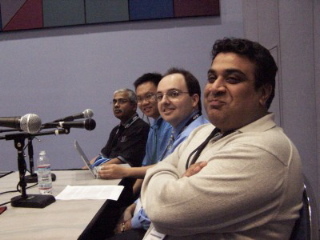 I have a lot of fun at the VoIP Blogger session with Andy Abramson, Dan Brekke, Jeff Pulver, Om Malik, Aswath Rao and Tom Keating. I am also pretty amazed at the numbers of people in the audience who read blogs and also blog themselves. Particularly, it is quite clear that most people read our blogs because they find they get faster news then technology media. The only regret I have is that we have not enough (voip) bloggers in Asia. While I travel often around Asia for my work and able to give some insight of whats happening over here, things are moving so fast here that I think we need more Asia VoIP bloggers. Incidently, I started reading some Chinese blogs site regularly. And yes, they support RSS and they have some pretty good RSS reader in China like 周博通. Much better then any of the English RSS Reader on Windows so give it a try. This would be an exciting news a year ago. But today, it sound just like “me too me too”. Yahoo, where have you been in the last 2 years? You are too late to the party. Why not acquire SixApart who is already doing very cool stuff? Internet media company Yahoo Inc. (Nasdaq:YHOO – news) is likely to build and buy tools that help its users create, publish and search blogs, Susquehanna Financial Group Marianne Wolk said in a note on Friday. Wolk also said she also expects the company to expand into social networking software, which lets users share and organize content. ps: I am not affiliated with SixApart in anyway – altho I have friends who work there. Several MT users has emailed me to write a Captcha solution to the latest trackback spams problem. Unfortunately, Captcha cannot be easily integrated with trackback. In fact, trackback spams are harder to catch because both legit and spams trackback are normally send by machines so any tools that tries to differentiate human from machine will not work. Nevertheless, I promised to do something about it so here is it: MT-TrackbackAntiSpam. The way it works is fairly simple – if the incoming trackback does not come from the host as stated in the URL, we reject the trackback. For example, if a trackback from url http://online-poker.psxtreme.com/ comes from 194.63.235.156 (an open proxy), then it is likely to be spam. (online-poker.psxtreme.com does not resolved to 194.63.235.156). Nevertheless, I been using it on my Drupal4Blogger for a while and it has been working well. I hope this works out for MT users too. I got another flood of trackback spams attack this time. Looks like it is getting worst – they perfect the technique and combined it with distributed zombie trackback pings. In just 12hrs, I got over 100+ such trackbacks. Luckily, all trackbacks need to go thru moderation and I can delete them with a zap. Still, it is not managable. Okay, I really got to find sometime to do the script to deal with it fairly soon.